On behalf of Pulsus Group, we are honoured to invite you to join the 9th International Conference on Dementia and Dementia Care which will be held from September 24-25, 2018 at London, UK. The conference will be organized around the theme “Novel approaches in Dementia Treatment and Care”. Dementia Care 2018 has been planned and implemented in accordance with the accreditation requirements and policies of the Accreditation Committee. We will likely convey an extraordinary program which covers the whole range of research in Dementia and Dementia care and share the multifaceted encounters of different treatment methodology. Dementia Care 2018 is an annual gabfest which glazes the entire range of research in Dementia and Dementia care and shares the various encounters of different treatment methodology. 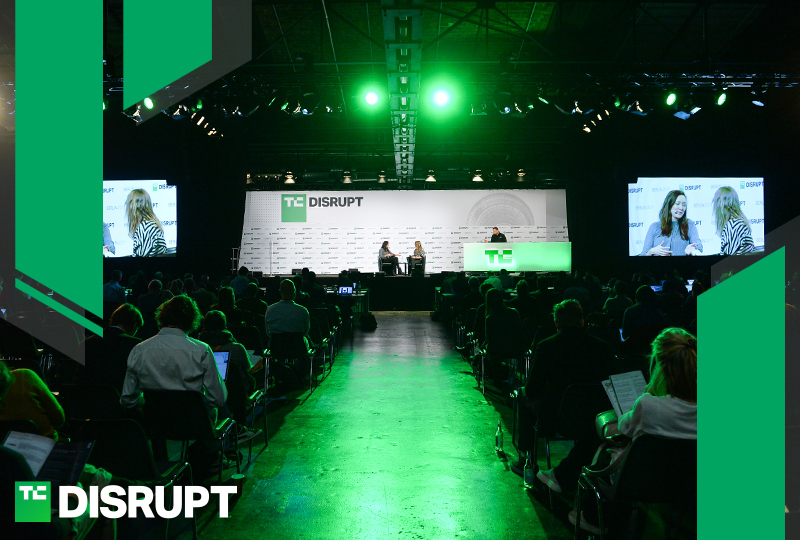 It is the platform for all the innovators, researchers, organizations, scholars to discuss and exhibit the recent advancements in the treatment, care and management of Dementia and it also brings together the researchers to dissertate novel drug discovery, technical development in care methods, on-going clinical trials, end of life issues and organizational development. Dementia still remains as one of the challenges in health care Internationally. It is reported that, across the globe about 35.6 million are living with Dementia and it is expected to double by 2030 and triple by 2050. This conference will provide scope for all the proficient people in the field of Neuro science and Psychiatry to accomplish their research relationships with each other and to discover global associates for future collaboration. With members from around the world focused on learning about Dementia and its advances; this is your best opportunity to reach the largest assemblage of participants from the Dementia community. Conduct presentations, distribute information, meet with current and potential scientists, make a splash with new discoveries in the Dementia treatment and diagnosis, and receive name recognition at this 2-day event. 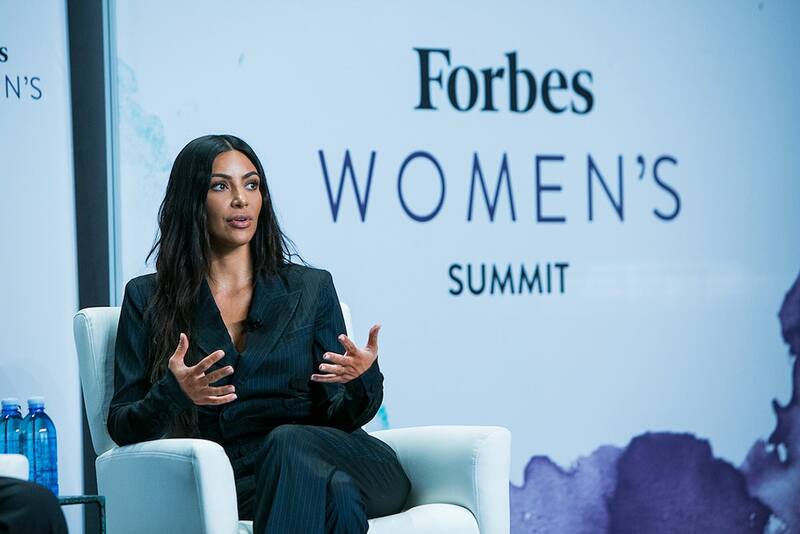 World-renowned speakers, the most recent techniques, developments, and the newest updates in Dementia Care, treatment, diagnosis are hallmarks of this conference. Dementia is a chronic Neurodegenerative disorder in which the complete deterioration of the intellectual functioning and behavior occurs.It results in progressive memory loss, thus affecting the lifestyle of the people. Dementia is not a single disease entity rather it is the group of symptoms. The common symptoms includes personality changes, inability to recognize, emotional problems, a failing sense of direction. It is stated by Alzheimer's society that around 50 million people are living with Dementia and it is also stated that for every three seconds, a person is developing Dementia. Dementia is prevailing as one of the priority condition in the field of medicine. Dementia is main leading cause of death in England and Wales over heart diseases. Alzheimer’s disease is 6th leading cause of death in the USA and it kills more than breast and prostate cancer combined. To solve problems of globally various Dementia conferences are arranged to find cure for Dementia society universally. The Reisberg scale is used to indicate the disease progression. If the person has no memory loss and if he/she is mentally stable and healthy, i.e, a normal person, is said to be in no cognitive stage of the syndrome. The stage 2 or very mild cognitive decline has no evident symptoms, due to ageing the forgetfulness, which is the common symptom emerges during this stage. During the third stage i.e, mild cognitive decline stage people experience increased forgetfulness, and face difficulty in finding words. Stage 4 or moderate cognitive decline includes severe symptoms like decrease in concentration, and the person faces difficulty such that he /she could not travel alone. In stage 5 or moderately severe cognitive decline occurs such that people have difficulties in completing tasks and people start withdrawing from social activities. Next is the middle dementia where the people tend to forget the recent memory activities. The last stage is that they have no ability to talk or communicate. They completely require human help and care. Alzheimer’s disease is most common type of Dementia. Alzheimer’s is a chronic Neurodegenerative disorder. Patient of Alzheimer’s shows early symptoms of short term memory and later progresses to problems in language, disorientation. Causes of Alzheimer’s are not clear yet, but 70% of risks are associated with genetics. There are no existing treatments to reverse or stop Alzheimer’s. Most of patients with alzheimer’s are above 65 years of age but 4-5% cases are of early onset Alzheimer’s. It’s still one of the costly diseases. Separate Alzheimer’s conferences has been arranged to make aware world for its consequences. In 2016, hundreds of conferences has main topic as Alzheimer’s disease as it contributes to 60-70% cases of Dementia. Several countries Governments are taking initiative in Alzheimer’s Congress such as UK, USA, Canada, France having high ratio of deaths due to Alzheimer’s patients and other Dementias. Vascular Dementia is second most common type of Dementia after Alzheimer’s. Brain has one of the richest networks, sudden changes in thinking causes problems in supply of oxygen and nutrients to brain, causes series of minor attacks. Vascular Dementia can’t be tracked until it has series of attacks. Death of brain cells causes problems in memory, thinking and reasoning. There are various types of Vascular Dementia such as Stroke-related Dementia, Post-stroke Dementia, Single-infarct and Multi-infarct Dementia, Sub cortical Dementia. High blood pressure, High blood cholesterol level, Diabetes are some risk factors which majorly contribute to the severity of Vascular Dementia. Vascular Dementia is common type of Dementia after Alzheimer’s disease contributing to nearly 20% cases making it significant in discussions of Dementia conference. Alpha synuclein protein depositions in neurons cause Lewy body Dementia. Symptoms of Lewy body Dementia are hallucinations, rigidness in movement. In Lewy body Dementia, disruption among brain cells occur, after one year of observation and progression in symptoms with Parkinson’s disease the diagnosis of Lewy body Dementia is possible. If cognitive problems occur with a year of movement problems doctors declares it as Lewy body Dementia and if not then it is declared as Parkinson’s disease. It is normal kind of Dementia after Alzheimer's illness and having same cases as Vascular Dementia making it critical in interloculation of Dementia meetings. Frontotemporal Dementia also known as Pick’s disease is broad term for group of disorders caused by progressive nerve cell loss in the frontal and temporal lobes of brain. Spindle neurons have 70% loss in Frontotemporal Dementia patients while other neurons remain unchanged. Temporal lobes have specific function such as right temporal lobe involved in recognition of faces and known objects. Left temporal lobe involved in meaning of names and words of objects. Frontotemporal Dementia includes changes in behavior, personality and difficulty in speech. It is significant cause of Dementia in younger people. MRI scans may show the frontal and temporal lobe atrophy. Posterior Cortical Atrophy also called as Benson's syndrome is a abberant variant of Alzheimer's disease, where the symptom is identified at the different part of the brain. It is one of the common Neuro degenerative disorders where the degeneration occurs in the cortex region of the brain. It is also due to the accumulation of amyloid protein in that region. The PCA affected patients show amyloid plaques and tangles in the neurofibrils. The challenge is that this syndrome shows distinct Neuropsychological deficits still remaining as the complicated forms of Dementia. PCA has been recognized for more than two decades, and yet the condition is almost abandoned by researchers. Hence it is the most suitable topic for discussion in the Dementia conference. Parkinson's disease Dementia is a cognitive decline in thinking and reasoning that develops in the person diagnosed with Parkinson's disease at least a year earlier. Parkinson's Dementia are similar to those caused by other health issues. For example, mental health issues such as depression can mimic Dementia. The reason behind development of Dementia is not completely understood in Parkinsons disease patient. Hence this conference will provide a platform to discuss the problem. The neurological conditions in which the Dementia occurs include some disorders like Parkinson's disease, Normal Pressure Hydrocephalus, Huntington's disease, and Creutzfeldt-Jakob disease (CJD). These diseases mimic Dementia or has Dementia as a major sign in the disease. The diseases associated with Dementia have the disease associates that include depression, brain tumors, nutritional deficiencies, head injuries, hydrocephalus, infections (AIDS, meningitis, syphilis), Drug reactions and Thyroid problems. The genetic factors are responsible for the establishment of disorders like Parkinsons disease, Down Syndrome, Creutzfeldt-Jakob disease, Normal Pressure Hydrocephalus, The other factors for Dementia includes physical factors like head injuries and Traumatic brain injuries. Neuroepigenetics is the field in Neuro biology that replaces the conventional thoughts on heritable epigenetic mechanisms, which involves in histone and chromatin modification which results in the variable expression of genes in the CNS . The numerous neuroepigenetic mechanisms have been involved in several Neurological and Neurodegenerative diseases for the regulation of various epigenetic mechanisms. All the mechanisms in Epigenetics will have a biochemical characteristics such that it helps in regulation process.The basic principle of Neuroepigenetics is that once DNA methylation patterns are established upon the genome in terminally differentiated cells, those modifications are permanent and essentially immutable. Other epigenetic molecular mechanisms are also in play in neurons some are ATP-dependent chromatin remodeling, genomic imprinting , SNF2 chromatin remodeling. Causes of Dementia depend on areas of brain affected due to Dementia. 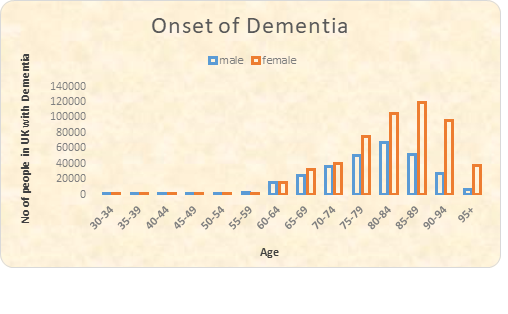 Dementia is progressive in nature; Age is one of the most important risk factor of Dementia, 65years exceeding persons has more chances of having Dementia. Ageing and genetic inheritance from ancestors is beyond control but other risk factors such as Hypertension, Hyperlipidaemia, Hyperthoiroidism, Alcohol use in large amounts, smoking can be prevented or controlled. Head injury, Stroke or Brain tumor may cause Dementia. Few risk factors can be prevented with healthy lifestyle and proper diet. Causes and risk elements have contributed enormously in Dementia research and discovered new measures in Dementia conferences. Bioinformatics advent can be used to regulate and evaluate data from the current high-throughput research technologies and render means for novel discoveries in the field of Neurodegenerative diseases. It is reported that there is a very little published data on Epigenomics. It is said that the data are obtained from high through put technologies in screening of human brain. These data intend the upcoming researchers to know and design their experiments. The Data Mining plays an important role in the prediction of the disorder, where the actual data is compared with the real data and the results are interpreted. The Transcriptomics and Proteomics studies has also been carried out providing necessary solutions for the problems. The assessment of Dementia in needed to rule out similar symptoms showing to such diseases such as depression, delirium which is curable. It is necessary to provide time to Dementia patients to plan future and make them literate about the possible effects in the future. There are various tests for diagnosing Dementia such as Mini Mental State Examination (MMSE), Mental Score Test, Trail Making Test. MMSE test include series of exercises in which various problems are checked with memory, speech, ability to respond. Blood test is also done to check levels of vitamin B12 and Thyroid hormones, which may be responsible. Brain scans such as MRI and CT scans used for checking brain tumor and Strokes in Vascular Dementia. Neurology gatherings talked rigorously on Dementia Diagnosis and it is always misleading to different conditions like Parkinson’s' disease. 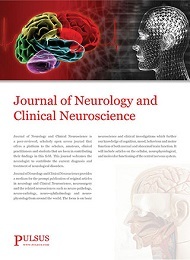 Hence discovery and establishment of new methodologies and techniques for analysis is in the urge for the Dementia society for dependable diagnosis methods. Treatment modality is a method that is followed to treat a patient suffering from a disease condition. The treatment modalities have three main approaches ,which include medical, psychological and sociocultural approaches. The most important consideration is that, in practice, no single treatment is considered sufficient for the treatment of Dementia. By now the combination therapy which involves the use of two or more drugs proves to be efficient. The other treatment methods which involve the stem cell therapy and gene therapy has now created the spotlight in the Dementia Treatment. Hence the advanced treatment methods can be discussed in the conference. Therapeutic targets are bio molecules maybe a nucleic acid or a protein whose biological activity can be modified by a drug candidate. In some cases of Dementia, it is reported that proteins are the cause for the disease. For example the accumulation of amyloid protein in the regions of Brain acts as a major factor for the disorder, hence it can be a therapeutic target . Therapeutic targets play an important role in identifying the potential drug candidates . Hence the conference provides the discussion sessions to reveal the targets for drug design process. Dementia is predominant disorder that affects more number of people around the world. Diagnosis of the patient with Dementia frightens the person affected by the syndrome, their family members and caretakers. Better understanding about public awareness of Dementia aids more effective health and social policies. Dementia patients need assistance and full time care as much as drugs. Some common care practices in Dementia are assistance in food and fluid consumption, pain management, social engagement ensuring safety and security of Dementia patients. Main aim of care practices is to ensure cut in hospitalization and psychotropic drugs. Understanding patient’s mood changes, particular behavior, speech problems and help in rectifying them. Dementia patients need end of life care so qualified nursing staff is needed. Few care practices which are used are indoor and outdoor activities, visual and audio stimulation, Art therapy. Care practices in Dementia have been critical to engage in international Dementia meetings. In need to evolve in Dementia care world gathering and genuine talks on Dementia care is required. The Dementia conference discusses public awareness as well as care practices to achieve higher rate of early diagnosis and to decrease the distress among the patient, family and caregivers. Case reports in Dementia supports the comprehensive report of causes, symptoms, treatment and possible outcome. Each case report distinguishes in conditions such as age, family background, treatment given and effects of it. This all helps to design, categorize the future aspects of disease. Case report will be highly helpful for the researchers to develop new methods for physicians to develop quick diagnosis methods in Dementia patients. Case reports in Dementia gives some thought regarding diagnosis, treatment and level of cure perhaps conceivable prevention to be taken moreover. Be that as it may, most recognized case reports is to be talked in the Dementia conference which would be extremely useful to researchers to carry on with their work. Dementia is out broken as the major threat in the UK. It is stated that, by now there are around 800,000 people in UK with dementia and the numbers are expected to rise to 1,142,677 by 2025 and 2,092,945 by 2051. It is also reported that around 45 000 people below the age of 65 are suffering from early onset of dementia and 773,502 are in late onset of Dementia. 311,730 (39%) of people living with dementia over 65 are living in care homes (either residential care or nursing homes) and 493,639 (61%) are living in the community among the people.Based on the onset of disease, more people are prone to Dementia in the late onset period. During the late onset period i.e., between the age of 65 to 95* women develop the disease more frequently than men. There are more women patients and victims than men in the late onset case. During the early onset of the disease i.e., between the age group 30-64 men are more prone to the disease than women. 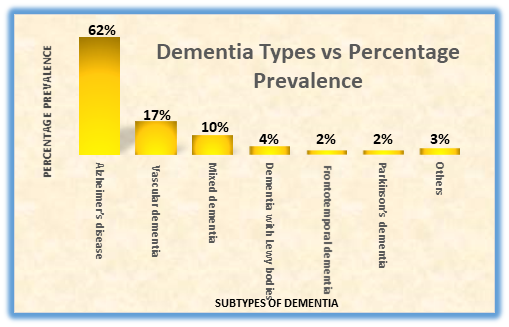 Among the Dementia sub types, Alzheimer’s is the major type contributing to 62% among all the sub types, and amidst the other sub types next ranks the Vascular Dementia which contributes for about 17% of the cases. Next lies the mixed dementia which is ranking third in prevalence. The other sub types which include Dementia with Lewy bodies is found in 4% of people, Frontotemporal dementia in 2%, Parkinson’s dementia in 2%. The other associated diseases with dementia contributes around 3 % of the cases. Dementia with not only ruining the life of people also cause a major impact on the economy in the society. 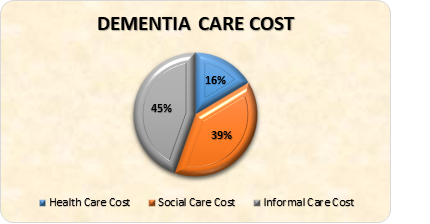 The greater part of the cost spent on Dementia care fall under three main categories health care cost, social care cost, informal care costs. The health care which includes hospitalization and treatment contributes about 16.4% of total cost, the social care which involves the care given by the nursing homes, home care contributes about 39 % of cost and the rest 44.6% comes under the informal care which the given by the family or friends related to the patient. Drugs that are available in the market for the treatment of dementia includes Memantine, Donepezil, Rivastigmine, Galantamine. Among these drugs Donepezil is considered as the most effective one, since it has cured dementia in about 59,931 people. It is also reported that about 30,000 people are treated with Rivastigmine. The Memantine ranks third in treating about 14,640 patients, the Galantamine drug cures Dementia in about 10,000 patients.